“A Warning to the Curious” was first published in The London Mercury (August 1925). 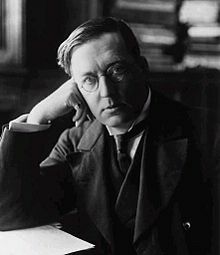 Later the same year, M. R. James published the tale in his anthology A Warning to the Curious and Other Ghost Stories. It’s the story of an archaeologist who goes on holiday in Suffolk and discovers the location of one of the three lost crowns of Anglia, which are believed to protect the British Isles from invasion. He digs it up and is subsequently stalked by the crown’s supernatural guardian. As I have said, I began to know Seaburgh as a child; but a gap of a good many years separates my early knowledge from that which is more recent. Still it keeps its place in my affections, and any tales of it that I pick up have an interest for me. One such tale is this: it came to me in a place very remote from Seaburgh, and quite accidentally, from a man whom I had been able to oblige—enough in his opinion to justify his making me his confidant to this extent. I know all that country more or less (he said). I used to go to Scaburgh pretty regularly for golf in the spring. I generally put up at the ‘Bear’, with a friend—Henry Long it was, you knew him perhaps—(‘Slightly,’ I said) and we used to take a sitting-room and be very happy there. Since he died I haven’t cared to go there. And I don’t know that I should anyhow after the particular thing that happened on our last visit. It was in April, 19 —, we were there, and by some chance we were almost the only people in the hotel. So the ordinary public rooms were practically empty, and we were the more surprised when, after dinner, our sitting-room door opened, and a young man put his head in. We were aware of this young man. He was rather a rabbity anaemic subject—light hair and light eyes—but not unpleasing. So when he said: ‘I beg your pardon, is this a private room?’ we did not growl and say: ‘Yes, it is,’ but Long said, or I did—no matter which: ‘Please come in.’ ‘Oh, may I?’ he said, and seemed relieved. Of course it was obvious that he wanted company; and as he was a reasonable kind of person—not the sort to bestow his whole family history on you—we urged him to make himself at home. ‘I dare say you find the other rooms rather bleak,’ I said. Yes, he did: but it was really too good of us, and so on. That being got over, he made some pretence of reading a book. Long was playing Patience, I was writing. It became plain to me after a few minutes that this visitor of ours was in rather a state of fidgets or nerves, which communicated itself to me, and so I put away my writing and turned to engaging him in talk. We were not likely to let the chance slip. We went with him; his room was only a few doors off. The boots was just collecting shoes in the passage: or so we thought: afterwards we were not sure. Our visitor—his name was Parton—was in a worse state of shivers than before, and went hurriedly into the room, and beckoned us after him, turned on the light, and shut the door carefully. Then he unlocked his kit-bag, and produced a bundle of clean pocket-handkerchiefs in which something was wrapped, laid it on the bed, and undid it. I can now say I have seen an actual Anglo–Saxon crown. It was of silver—as the Rendlesham one is always said to have been—it was set with some gems, mostly antique intaglios and cameos, and was of rather plain, almost rough workmanship. In fact, it was like those you see on the coins and in the manuscripts. I found no reason to think it was later than the ninth century. I was intensely interested, of course, and I wanted to turn it over in my hands, but Paxton prevented me. ‘Don’t you touch it,’ he said, ‘I’ll do that.’ And with a sigh that was, I declare to you, dreadful to hear, he took it up and turned it about so that we could see every part of it. ‘Seen enough?’ he said at last, and we nodded. He wrapped it up and locked it in his bag, and stood looking at us dumbly. ‘Come back to our room,’ Long said, ‘and tell us what the trouble is.’ He thanked us, and said: ‘Will you go first and see if — if the coast is clear?’ That wasn’t very intelligible, for our proceedings hadn’t been, after all, very suspicious, and the hotel, as I said, was practically empty. However, we were beginning to have inklings of—we didn’t know what, and anyhow nerves are infectious. So we did go, first peering out as we opened the door, and fancying (I found we both had the fancy) that a shadow, or more than a shadow—but it made no sound—passed from before us to one side as we came out into the passage. ‘It’s all right,’ we whispered to Paxton—whispering seemed the proper tone—and we went, with him between us, back to our sitting-room. I was preparing, when we got there, to be ecstatic about the unique interest of what we had seen, but when I looked at Paxton I saw that would be terribly out of place, and I left it to him to begin. Then it all came out: Paxton looked over his shoulder and beckoned to us to come nearer to him, and began speaking in a low voice: we listened most intently, of course, and compared notes afterwards, and I wrote down our version, so I am confident I have what he told us almost word for word. He said: ‘It began when I was first prospecting, and put me off again and again. There was always somebody—a man—standing by one of the firs. This was in daylight, you know. He was never in front of me. I always saw him with the tail of my eye on the left or the right, and he was never there when I looked straight for him. I would lie down for quite a long time and take careful observations, and make sure there was no one, and then when I got up and began prospecting again, there he was. And he began to give me hints, besides; for wherever I put that prayer-book—short of locking it up, which I did at last—when I came back to my loom it was always out on my table open at the fly-leaf where the names are, and one of my razors across it to keep it open. I’m sure he just can’t open my bag, or something more would have happened. You see, he’s light and weak, but all the same I daren’t face him. Well, then, when I was making the tunnel, of course it was worse, and if I hadn’t been so keen I should have dropped the whole thing and run. It was like someone scraping at my back all the time: I thought for a long time it was only soil dropping on me, but as I got nearer the—the crown, it was unmistakable. And when I actually laid it bare and got my fingers into the ring of it and pulled it out, there came a sort of cry behind me—oh, I can’t tell you how desolate it was! And horribly threatening too. It spoilt all my pleasure in my find—cut it off that moment. And if I hadn’t been the wretched fool I am, I should have put the thing back and left it. But I didn’t. The rest of the time was just awful. I had hours to get through before I could decently come back to the hotel. First I spent time filling up my tunnel and covering my tracks, and all the while he was there trying to thwart me. Sometimes, you know, you see him, and sometimes you don’t, just as he pleases, I think: he’s there, but he has some power over your eyes. Well, I wasn’t off the spot very long before sunrise, and then I had to get to the junction for Seaburgh, and take a train back. And though it was daylight fairly soon, I don’t know if that made it much better. There were always hedges, or gorse-bushes, or park fences along the road—some sort of cover, I mean—and I was never easy for a second. And then when I began to meet people going to work, they always looked behind me very strangely: it might have been that they were surprised at seeing anyone so early; but I didn’t think it was only that, and I don’t now: they didn’t look exactly at me. And the porter at the train was like that too. And the guard held open the door after I’d got into the carriage—just as he would if there was somebody else coming, you know. Oh, you may be very sure it isn’t my fancy,’ he said with a dull sort of laugh. Then he went on: ‘And even if I do get it put back, he won’t forgive me: I can tell that. And I was so happy a fortnight ago.’ He dropped into a chair, and I believe he began to cry. We didn’t know what to say, but we felt we must come to the rescue somehow, and so—it really seemed the only thing—we said if he was so set on putting the crown back in its place, we would help him. And I must say that after what we had heard it did seem the right thing. If these horrid consequences had come on this poor man, might there not really be something in the original idea of the crown having some curious power bound up with it, to guard the coast? At least, that was my feeling, and I think it was Long’s too. Our offer was very welcome to Paxton, anyhow. When could we do it? It was nearing half-past ten. Could we contrive to make a late walk plausible to the hotel people that very night? We looked out of the window: there was a brilliant full moon—the Paschal moon. Long undertook to tackle the boots and propitiate him. He was to say that we should not be much over the hour, and if we did find it so pleasant that we stopped out a bit longer we would see that he didn’t lose by sitting up. Well, we were pretty regular customers of the hotel, and did not give much trouble, and were considered by the servants to be not under the mark in the way of tips; and so the boots was propitiated, and let us out on to the sea-front, and remained, as we heard later, looking after us. Paxton had a large coat over his arm, under which was the wrapped-up crown. So we were off on this strange errand before we had time to think how very much out of the way it was. I have told this part quite shortly on purpose, for it really does represent the haste with which we settled our plan and took action. ‘The shortest way is up the hill and through the churchyard,’ Paxton said, as we stood a moment before, the hotel looking up and down the front. There was nobody about—nobody at all. Seaburgh out of the season is an early, quiet place. ‘We can’t go along the dyke by the cottage, because of the dog,’ Paxton also said, when I pointed to what I thought a shorter way along the front and across two fields. The reason he gave was good enough. We went up the road to the church, and turned in at the churchyard gate. I confess to having thought that there might be some one lying there who might be conscious of our business: but if it was so, they were also conscious that one who was on their side, so to say, had us under surveillance, and we saw no sign of them. But under observation we felt we were, as I have never felt it at another time. Specially was it so when we passed out of the churchyard into a narrow path with close high hedges, through which we hurried as Christian did through that Valley; and so got out into open fields. Then along hedges, though I would sooner have been in the open, where I could see if anyone was visible behind me; over a gate or two, and then a swerve to the left, taking us up on to the ridge which ended in that mound. Paxton pulled himself out of the hole, and stretched a hand back to us. ‘Give it to me,’ he whispered, ‘unwrapped.’ We pulled off the handkerchiefs, and he took the crown. The moonlight just fell on it as he snatched it. We had not ourselves touched that bit of metal, and I have thought since that it was just as well. In another moment Paxton was out of the hole again and busy shovelling back the soil with hands that were already bleeding He would have none of our help though. It was much the longest part of the job to get the place to look undisturbed yet—I don’t know how—he made a wonderful success of it. At last he was satisfied and we turned back. We were a couple of hundred yards from the hill when Long suddenly said to him: ‘I say you’ve left your coat there. That won’t do. See?’ And I certainly did see it—the long dark overcoat lying where the tunnel had been. Paxton had not stopped, however: he only shook his head, and held up the coat on his arm. And when we joined him, he said, without any excitement, but as if nothing mattered any more: ‘That wasn’t my coat.’ And, indeed, when we looked back again, that dark thing was not to be seen. Well, we got out on to the road, and came rapidly back that way. It was well before twelve when we got in, trying to put a good face on it, and saying—Long and I—what a lovely night it was for a walk. The boots was on the look-out for us, and we made remarks like that for his edification as we entered the hotel. He gave another look up and down the sea-front before he locked the front door, and said: ‘You didn’t meet many people about, I s’pose, sir?’ ‘No, indeed, not a soul,’ I said; at which I remember Paxton looked oddly at me. ‘Only I thought I see someone turn up the station road after you gentlemen,’ said the boots. ‘Still, you was three together, and I don’t suppose he meant mischief.’ I didn’t know what to say; Long merely said ‘Good night,’ and we went off upstairs, promising to turn out all lights, and to go to bed in a few minutes. Back in our room, we did our very best to make Paxton take a cheerful view. There’s the crown safe back,’ we said; ‘very likely you’d have done better not to touch it’ (and he heavily assented to that), ‘but no real harm has been done, and we shall never give this away to anyone who would be so mad as to go near it. Besides, don’t you feel better yourself? I don’t mind confessing,’ I said, ‘that on the way there I was very much inclined to take your view about—well, about being followed; but going back, it wasn’t at all the same thing, was it?’ No, it wouldn’t do: ‘You’ve nothing to trouble yourselves about,’ he said, ‘but I’m not forgiven. I’ve got to pay for that miserable sacrilege still. I know what you are going to say. The Church might help. Yes, but it’s the body that has to suffer. It’s true I’m not feeling that he’s waiting outside for me just now. But—’ Then he stopped. Then he turned to thanking us, and we put him off as soon as we could. And naturally we pressed him to use our sitting-room next day, and said we should be glad to go out with him. Or did he play golf, perhaps? Yes, he did, but he didn’t think he should care about that tomorrow. Well, we recommended him to get up late and sit in our room in the morning while we were playing, and we would have a walk later in the day. He was very submissive and piano about it all: ready to do just what we thought best, but clearly quite certain in his own mind that what was coming could not be averted or palliated. You’ll wonder why we didn’t insist on accompanying him to his home and seeing him safe into the care of brothers or someone. The fact was he had nobody. He had had a flat in town, but lately he had made up his mind to settle for a time in Sweden, and he had dismantled his flat and shipped off his belongings, and was whiling away a fortnight or three weeks before he made a start. Anyhow, we didn’t see what we could do better than sleep on it—or not sleep very much, as was my case and see what we felt like tomorrow morning. Without a word we ran that way too—it was the opposite direction to that of last night’s expedition. It wasn’t quite four o’clock, and the day was fair, though not so fair as it had been, so that was really no reason, you’d say, for anxiety: with people about, surely a man couldn’t come to much harm. Long said he saw Paxton some distance ahead, running and waving his stick, as if he wanted to signal to people who were on ahead of him. I couldn’t be sure: one of these sea-mists was coming up very quickly from the south. There was someone, that’s all I could say. And there were tracks on the sand as of someone running who wore shoes; and there were other tracks made before those—for the shoes sometimes trod in them and interfered with them—of someone not in shoes. Oh, of course, it’s only my word you’ve got to take for all this: Long’s dead, we’d no time or means to make sketches or take casts, and the next tide washed everything away. All we could do was to notice these marks as we hurried on. But there they were over and over again, and we had no doubt whatever that what we saw was the track of a bare foot, and one that showed more bones than flesh. The notion of Paxton running after—after anything like this, and supposing it to be the friends he was looking for, was very dreadful to us. You can guess what we fancied: how the thing he was following might stop suddenly and turn round on him, and what sort of face it would show, half-seen at first in the mist—which all the while was getting thicker and thicker. And as I ran on wondering how the poor wretch could have been lured into mistaking that other thing for us, I remembered his saying, ‘He has some power over your eyes.’ And then I wondered what the end would be, for I had no hope now that the end could be averted, and—well, there is no need to tell all the dismal and horrid thoughts that flitted through my head as we ran on into the mist. It was uncanny, too, that the sun should still be bright in the sky and we could see nothing. We could only tell that we were now past the houses and had reached that gap there is between them and the old martello tower. When you are past the tower, you know, there is nothing but shingle for a long way—not a house, not a human creature; just that spit of land, or rather shingle, with the river on your right and the sea on your left. At the same moment, just as we were scrambling down from the battery to get to the body, we heard a shout, and saw a man running down the bank of the martello tower. He was the caretaker stationed there, and his keen old eyes had managed to descry through the mist that something was wrong. He had seen Paxton fall, and had seen us a moment after, running up—fortunate this, for otherwise we could hardly have escaped suspicion of being concerned in the dreadful business. Had he, we asked, caught sight of anybody attacking our friend? He could not be sure.